PayWindow Payroll Software Download today for FREE! Looking for a new Payroll System? Download and try PayWindow today! The PayWindow Payroll system can be downloaded for a FREE 30 day trial! So try our award winning payroll software for 30 days for FREE and purchase only after you've seen for yourself how easy paying your employees can be with PayWindow. You will be ready to start your payroll processing immediately with this easy to use software. So stop doing payroll by hand or replace your expensive solutions with our affordable software! PayWindow runs on Windows Vista, Windows 7, Windows 8 and Windows 10. Turn hours of work into minutes with this easy to use payroll software package! 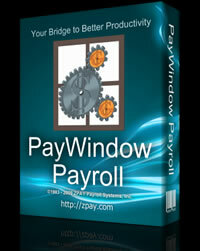 PayWindow The Easy To Use Payroll Software! Performing your own payroll is fast and easy with the PayWindow payroll software. With our FREE 30 day trial, you can download the PayWindow Payroll software and be doing it yourself today! PayWindow has to be the easiest there is to use with our simple to follow on-line tutorials that show you everything you need to know in less than an hour. Download and try the PayWindow Payroll software and use the tutorials to get started and see for yourself. Payroll processing does not get any easier! PayWindow to QuickBooks data transfer tool. PayWindow users who also use QuickBooks 2002 - 2012 Pro or Premiere can post transactions from PayWindow with a few clicks of the mouse. Go to our download page and download this free utility. Users of QuickBooks from Intuit, formerly Quicken, now have an alternative to use. 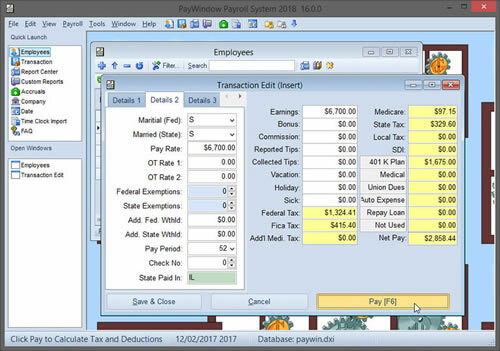 ZPAY Payroll Systems, Inc, has spent over 30 years of creating easy to use great software for small businesses and large businesses alike with the release of PayWindow 2018! PayWindow 2018 is a full featured easy to use payroll package for Windows Vista, Windows 7, Windows 8 and Windows 10. Standard Checks and Forms designed around Forms Fulfillment Center forms where you can get a 25% discount off of your first order from them. Enjoy a 25% discount off your first order & insure you receive the proper forms by purchasing using this link http://www.formsfulfillment.com/zpaysoftware/ or calling our forms representative at 1-800-544-3427 and give them this Discount Code: P04121-199. If you really want to take a look before downloading the program to try for yourself, visit our Tutorials Page 9the link is under Support above) that will take you by the hand through using the program. Or just go ahead and download our FREE 30-day trial from the Download link in the menu on the top of the page. Now is the time to take control of your payroll whether you have a small business, medium or large business, PayWindow can fit your needs. Stop paying out your profits to a payroll service when you can do it yourself for a lot less and have total control.